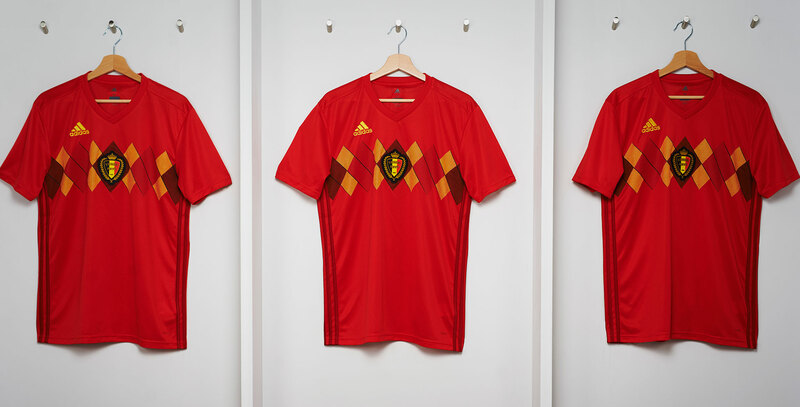 adidas has dropped a lot of 2018 FIFA World Cup shirts today, and this includes one of the tournament's biggest outsiders, Belgium. Might actually be the best shirt of them all if you ask me. Enjoy! In decades, Belgium has struggled to perform in the World Cups, the best result being a fourth place in 1986. The previous WC in Brazil saw Belgium reach the Quarter-finals, and this time the hopeful football nation aims to take the next step. Being one of the first countries to book a ticket for Russia, Belgium destroyed the opponents in the qualifiers, making Hazard and co. one of the outsiders to lift the trophy in 2018. There have been lots of other World Cup 2018 shirts launched today. Read more about Spain, Argentina, Germany by clicking the name.. In line with adidas' other kits for the 2018 World Cup, the new Belgium shirt has a clear retro reference and is closely inspired by the EURO 1984 kit, one of the national team's most iconic designs ever - worth a google search as well. Being predominantly red, the new Belgium shirt features yellow for the adidas logo and dark red for the Three Stripes, which run down the sides. Compared to the old design, the white band across the front was dropped for the 2018 WC Belgium kit. This results in a more modern, yet still vintage design, that still includes the rather unusual graphic print on the front, consisting of the colours of the Belgium flag with the federation badge in its center. All in all, this shirt is most certainly suited both for the pitch and the streets. A classic kit reborn. Want to support Belgium at the World Cup? Pre-order the shirt right here.